If you’re reading this, you clearly use the Internet. And if you use the Internet, you clearly know Google AdSense. It’s pretty much everywhere (even on this site in places). But as much as Google would like you to believe they are serving up ads that users want to click on because they are relevant, these are still ads, and most people do not want to click on them. OneRiot’s new product, RiotWise, has an interesting spin on relevant ads. You see, RiotWise’s ads are only ads in the sense that someone is paying to place them in a certain highlighted position on the page. But in fact, all of these “ads” are content. And I don’t mean content like the homepage of a website, I mean stories/posts/articles about a particular topic. Just as with Google, these are served up via keywords being searched for. But unlike Google, advertisers aren’t bidding on keywords. Instead, content producers strike a deal with OneRiot to place their content in an emphasized (but clearly labeled) place in their realtime feed. The reason they would want to do this should be obvious: Clicks-throughs. Any content producer who is likely to use such a program undoubtedly already has a strategy in place to monetize their site. That is quite likely based around the traffic their site receives, and RiotWise’s goal would be to help the content producer increase that traffic. But more importantly, it would be to increase the traffic by sending highly-targeted readers whose intent is to find specific content being displayed on the page, OneRiot CEO Kimbal Musk tell us. The obvious question is: How can OneRiot be sure this is relevant content and not just a spam blog looking for clicks? As a realtime search engine, OneRiot already devotes a large percentage of its team to spam prevention, OneRiot general manager Tobias Peggs says. And OneRiot’s engine is already doing the hard work of going through millions of pieces of content to determine what is relevant and what isn’t. With RiotWise, it’s just a question of taking the content from the providers who are using the service and pulling it out to highlight it. So where will it be highlighted? Initially, RiotWise will roll out on OneRiot’s main site. This sponsored content would be housed in a right-hand column, separate from the main realtime feed, as you can see in the picture above. Yes, it looks a lot like AdSense, but it’s content. This aspect of RiotWise will be launching next week. But the bigger picture for RiotWise is to include this sponsored content in the feeds that OneRiot sends to all of its partners. 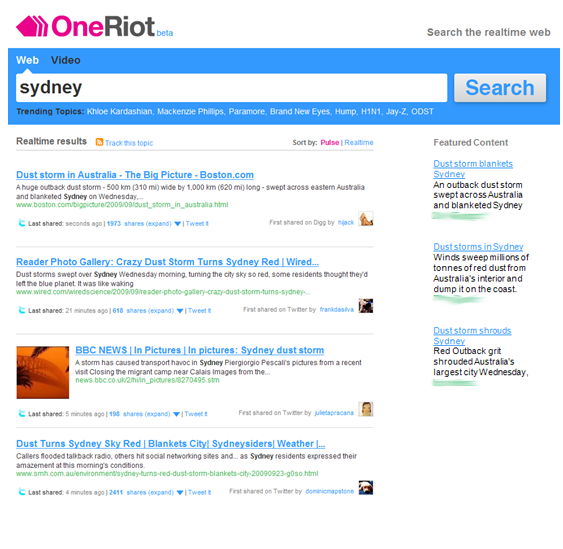 This means that third-party sites using OneRiot search results will eventually see RiotWise as well. Also, it means that places which pull in one OneRiot feeds, such a some Twitter feeds, will start getting these sponsored results as well. Musk realizes that it’s important to be delicate when inserting ads into streams. He notes that just as with sponsored results, sponsored items in feed streams will be clearly labeled as such. He also notes that it’s important not to overload users with too many of these sponsored results in that setting. Ideally, OneRiots algorithms would be tailored to serve up just one sponsored result a day that a user would want to click on, he says. The key to all of this is the realtime aspect of OneRiot. Because people are becoming more and more interested in realtime search, getting access to information that is going on right now, OneRiot has been seeing strong click-through rates on items and big numbers when it comes to users doing multiple searches, we’re told. And OneRiot’s RiotFeeds product, which sends OneRiot results surrounding certain topics over to Twitter has been gaining popularity, and is also seeing big-time click-throughs on its links. A solution like RiotWise seems like the perfect idea for a new or second-tier blog that feels its content is good, but isn’t getting the exposure that some of the big guys do. As long as the content is good, OneRiot is happy to accept it, and strike a deal with the producer to take some fees on a CPC-basis, the majority of which would then be handed over to OneRiot’s partners that serve up its content. “This is the way to monetize the real-time web,” Musk says. As I mentioned above, the plan is to launch RiotWise on OneRiot first as early as Monday of next week. A couple weeks after that, the company hopes to roll out the sponsored results to its partners, letting the money sharing begin. A month ago, OneRiot raised a new $7 million third round of funding.